This is Olivia. Olivia is awesome. This book is awesome. I shall be using awesome quite a lot throughout this review, so I just wanted to warn you in advance. I want you to take a moment and think about every signal that that front cover is giving you about how it wants to be read. About how it should be read, really, it’s more than want somehow. I want you to think about the colours used. I want you to think about the fact that there is only a title. I want you to think about the size of that title and of the shift of fonts. I want you to read it out loud and try to read that title as the fonts and the size and the placement is asking you to read it. Everything on a perfect cover like this is done for a reason. Everything. And there is everything on this cover and it is just being given to you on a plate. And then we have this. What I want you to take from this page (apart from sheer genuine delight at how perfect a picture book can be and how it can say so much with one single page) is the idea of placement. This is a fairly well sized book. There’s a lot of page. 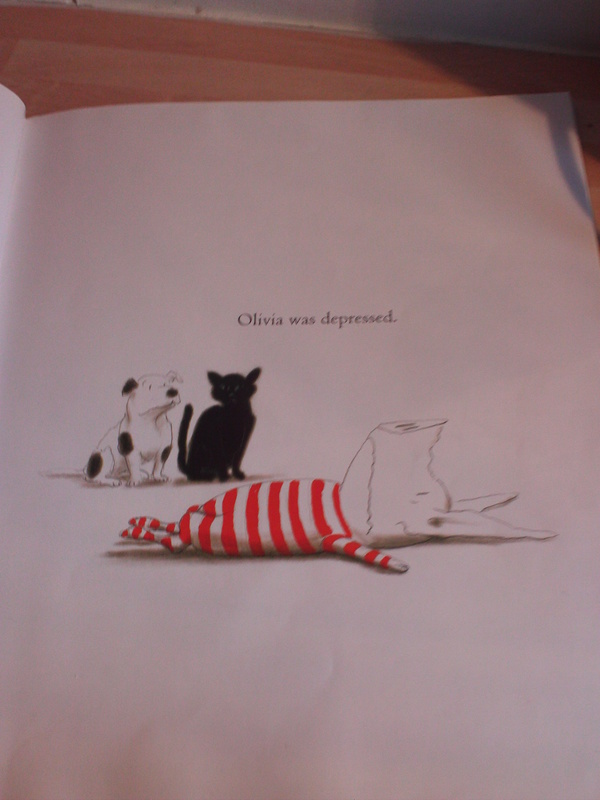 And here we have Olivia, slap bang in the middle of the first page, right in the centre of your eyeline and she is suffering from the weight of the world (embodied by this heavy and close text, right above her) and it is awesome. It is a page that is just perfect and every time I look at it, I crack up. Genuinely. (And if you’re interested more about placement and white space, go and have a look at what I thought of ‘Ellen and Penguin’ by Clara Vulliamy which is a divine example of such a thing). So. We have a book that in two short moments (for we must always include the front cover in such a consideration) has given us everything. 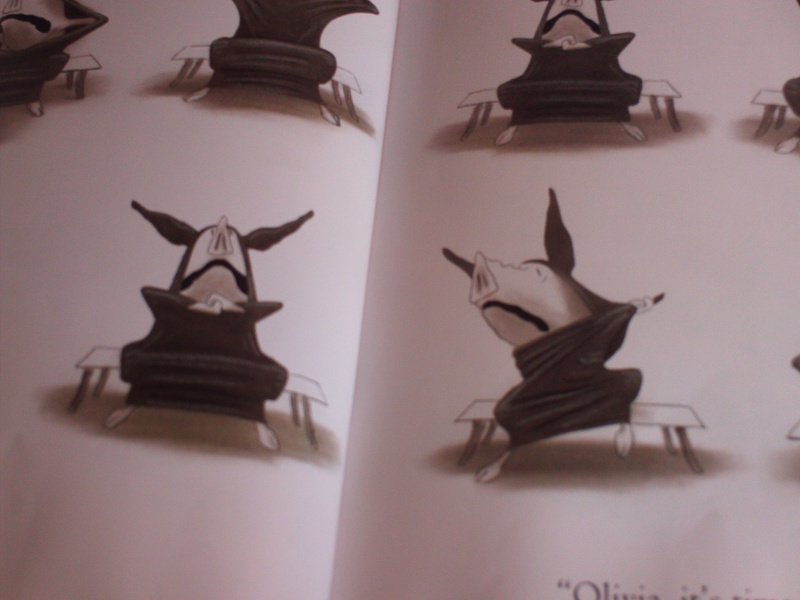 It’s given us Olivia; a pig who is so glorious that her character spills from every line drawn. She is exuberant. Vivid. And she is, as that title has told us, quite definitely a star. This book is full of transcendent moments. I won’t spoil the plot (because really, the beats of Falconer’s storytelling are something quite delightful and that should be experienced first hand). I will, however, leave you with some more moments. Because this book really is. God I love this book. You can view all the other picture books in depth posts here (and that tag also includes my a-z of picture book terminology – all the things I think about when I review a picture book). 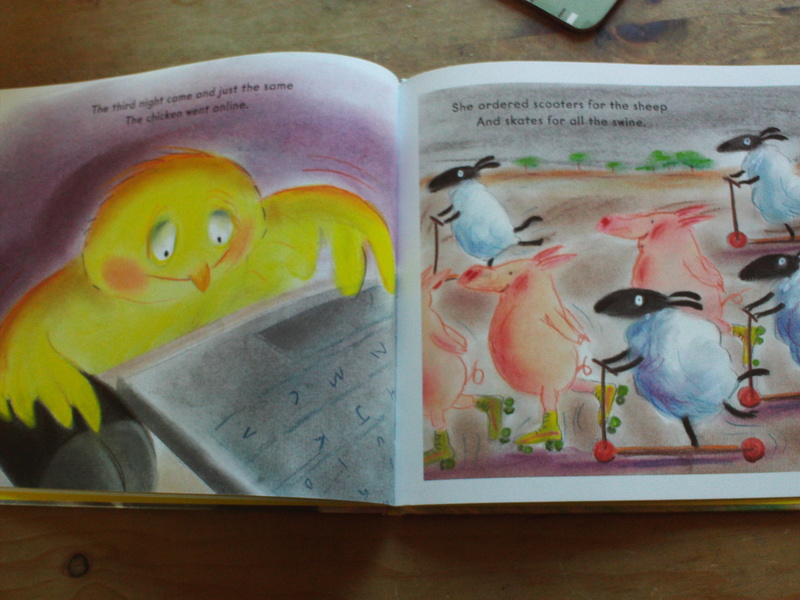 I’ve been thinking about these posts from Sarah McIntyre and how I work with picture books. 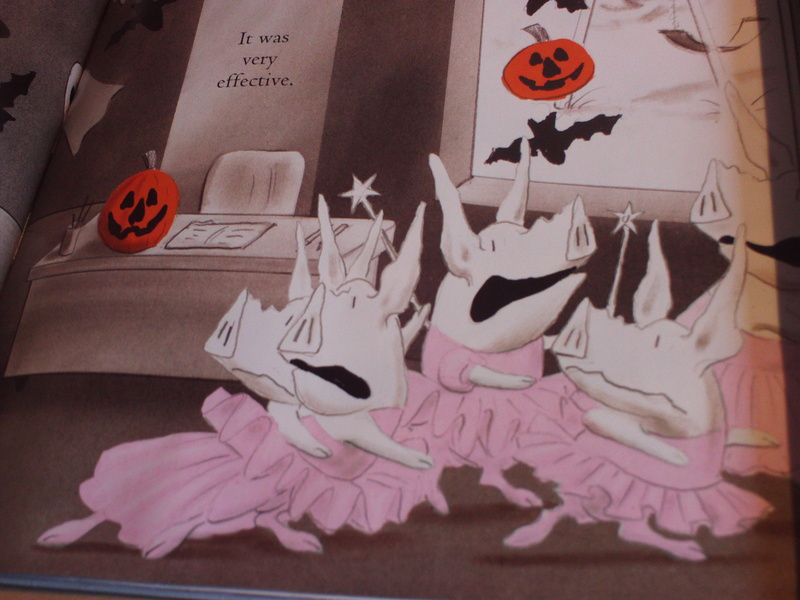 I could talk, quite happily about picture books all day and I’m very conscious that when I start going on about recto and verso and page turns and white space that it’s a language quite foreign to many. So, in an effort to address that – here we are. I’ve had a go at putting down an A-Z of picture book terminology. It’s not exhaustive, nor is it perfect, but it is a reflection of all the things I think about when I’m looking at picture books. It is, perhaps, a conversation starter. Please feel free to adapt and utilise if you think it’s of use for yourself and your purposes (ps – I’d be v interested to hear if you do use it!). Have a look at the #picturesmeanbusiness tag on Twitter for more about this campaign. 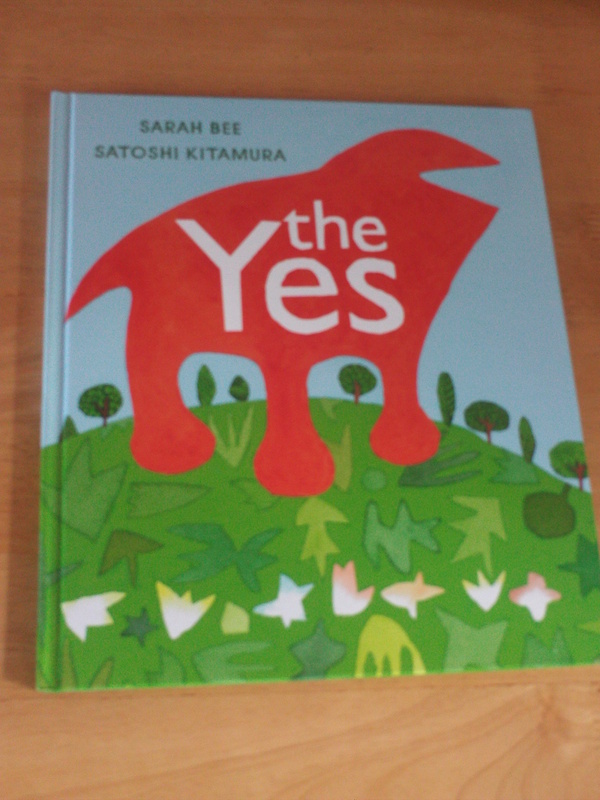 The debut title from Beast In Show Books, this picture book promises great things. 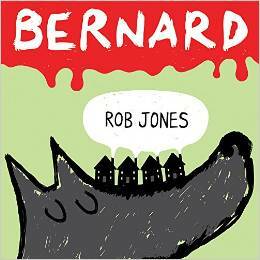 Written and illustrated by Rob Jones, it tells the story of Bernard a ‘misunderstood wild hound’ who just wants to eat strawberry jam. Before we start, I think you need to know two things. 1. 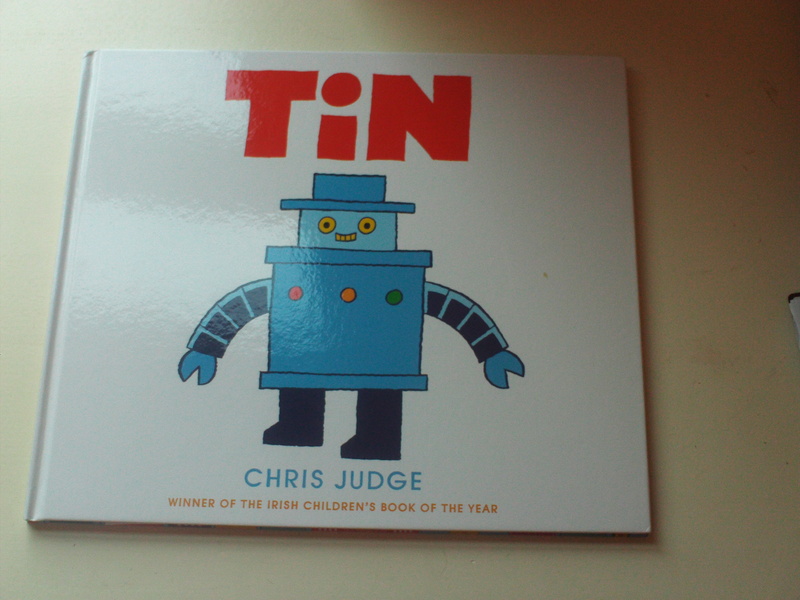 I think I’m a little bit in love with what Nosy Crow do with their picture books. 2. I am very much a fan of what Elys Dolan does. I loved Weasels and when I saw Nuts In Space, I shrieked and leapt across the library with joy. I had high hopes for Nuts In Space, and it delivered. It delivered best, I think, at 4.30pm this afternoon, when I was having another look at Nuts In Space and figuring out what I wanted to say about it because it was at this point that I saw the little detail on the ship in the bottom right hand corner of the title spread. (fig 1). 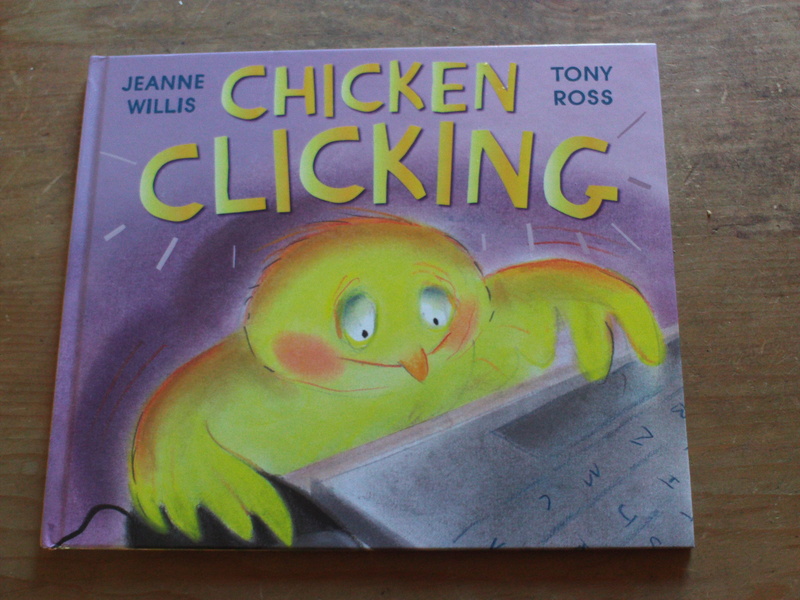 Chicken Clicking is a picture book from the amazing pairing of Jeanne Willis and Tony Ross. The back catalogue of these two authors is a solidly joyous thing, so I was very pleased to receive this from Andersen Press for review. It’s a joy, really. 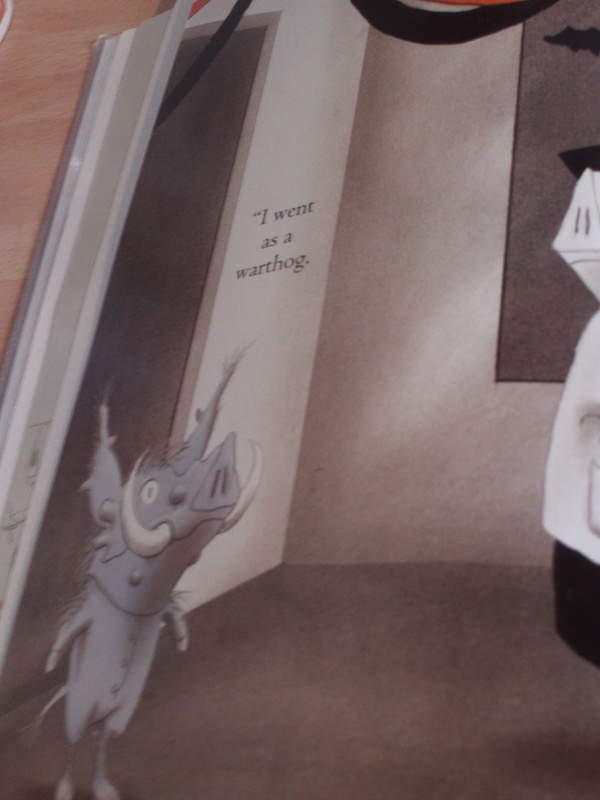 I like wallowing in picture books. I like it when they’re provacative and clever and funny. I liked this. May I tell you why and how? I have been aching to do another picture book in depth post for a while now. Whilst I know picture books aren’t the main focus of this blog, they are one of my great and genuine joys and they are something very, very important. 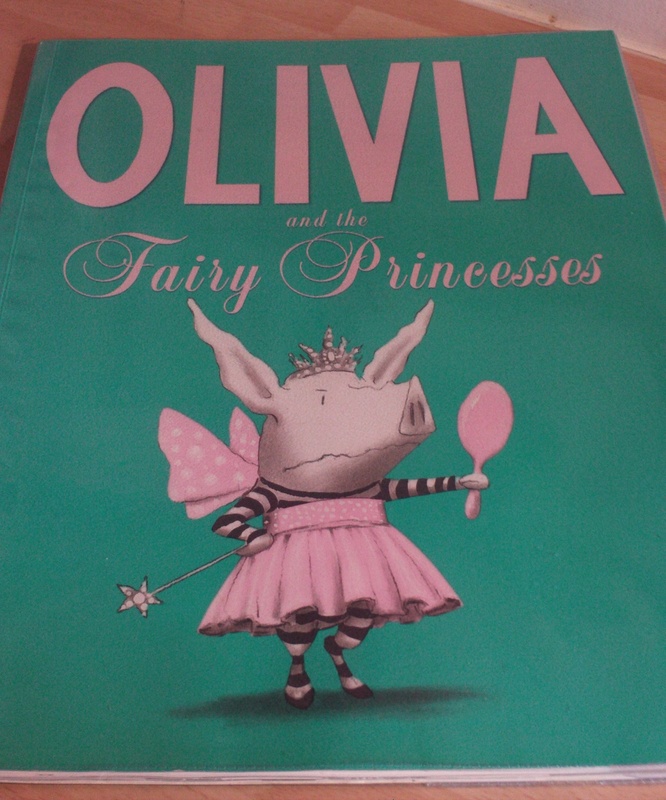 Picture books are our introduction to literacy. They’re read by us in so many ways as our reading ability develops, and as such they have to work on a ridiculous amount of levels. They have to reward the adult reader. The child pre-literate. The child emerging literate. The child literate. And quite often they do that with maybe a handful of words, or none.